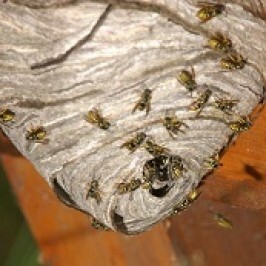 A Yellow Jacket and Wasp treatment and Nest Removal service is included with our premium care service. Although there are a lot of different Yellow Jackets and wasps in Oregon, we are severely affected by paper wasps and honey bees. 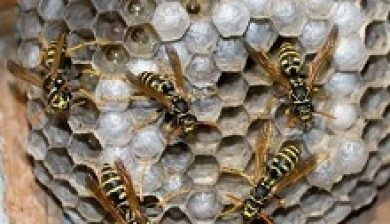 If you find paper wasp or yellow jackets around your home we can treat and remove the nest or nests from your home. While honey bees are widely considered beneficial, if you find a honey bee nest in your home it will need be be removed. In this case we will have a bee keeper try to remove the bees at no charge to you. We offer fast effective Yellow Jacket removal. We are local to the Sherwood, Newberg and Wilsonville area so our prompt service and friendly staff can control your pest fast. Bees, yellow jackets, wasps, and or hornets can get out of hand quickly. Whether you are allergic to them or not they can still be dangerous. Dangers will increase for infants, young children, elderly, and small pets that move around the inside or outside of your home. They can build nests rather fast and are very discreet until the weather warms up. Near to end summer and fall they start to become really aggressive. Some bees, when they attack, release pheromones. These pheromones (a special type of odor), will alert bees from the same area to come an attack the person who has just been stung, causing a fury of attacks. If this happens to you or someone in your household, seek medical treatment. If you have any questions in regard to safety measures to take, or when you start to see any bees, wasps, yellow jackets, or hornets contact us right away to prevent any possible attacks.